Now your computer can simulate the movement of light through fog in a way that will easily fool the untrained eye. Using new "photon mapping" algorithms that map how light would bounce off water particles in the air (i.e. fog), UC San Diego computer scientists can now whip up a quick, realistic fog world for a videogame or movie without a lot of expensive computer power. Compare the photon mapped image above, with what the same amount of computing power would have produced without the algorithm, below. Much of the richness in images created with photon mapping algorithms comes from precise accounting for the amount of light is in a scene and where that light is. Photon mapping algorithms provide a way to follow the light around the scene, as it bounces off various objects and lands on other objects. Photon mapping can also determine how light will interact with fog, smoke or other "participating media" that absorb, reflect and scatter some portion of the light - a task that has been traditionally quite computationally costly to perform because it requires sampling the light at many locations in order to make sure that nearly all the light is accounted for. "Instead of computing the light at thousands of discrete points along the ray between the camera and the object, which is the conventional approach, we compute the lighting along the whole length of the ray all at once," said [computer science researcher Wojciech] Jarosz. 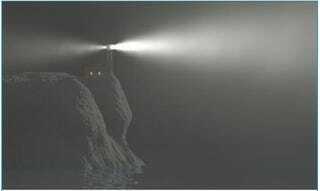 Another remake of classic horror flick The Fog, please! Only this time I want it in space!